“Hey babe, how would you like to do the Power of Four?” My husband asked me – while my mind was probably somewhere else. I either wasn’t paying that much attention, or am just plain insane, because I answered in the positive. 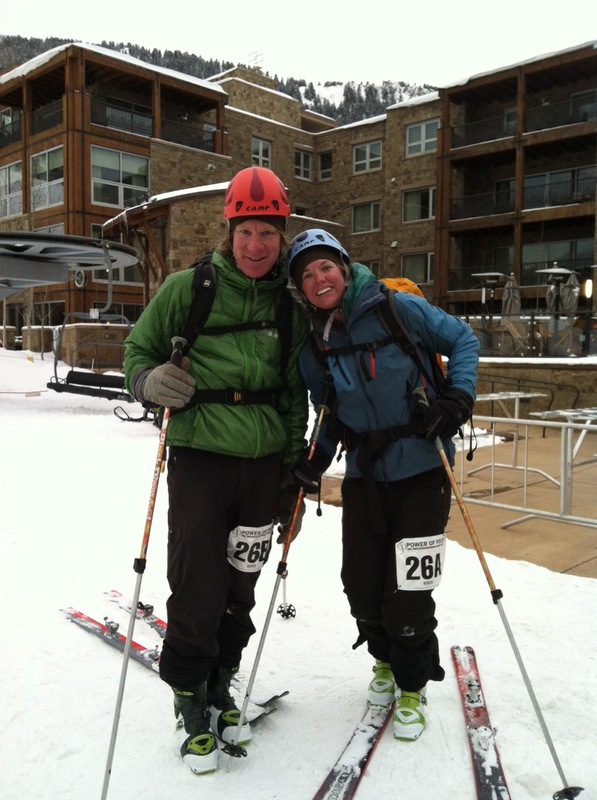 “It will be more of a training session for the Elk Mountain Grand Traverse,” he reassured me. What was going through my head when I said yes to a race with 12,000’ elevation gain over 26 miles – up and down all four Aspen mountains – I wonder to myself as Dan and I are riding the racer transportation bus to the base of Snowmass at four A.M., gazing in a stupor around me at the people I was supposed to be competing against. Dan and I have good, light gear, but these people’s gear quite clearly put us in the “heavy metal” category. I thought about reading how over half of the teams who started last year hadn’t finished. I was shaking with nerves as I put my boots on, slipping toe warmers into the iceboxes. Glancing around the bus again, I realized that I was going to be one of about 15 women – and yes, these were most certainly women. Women who have done the unthinkable, like the Leadville 100 and Montezuma’s Revenge. Women, burly and weather worn, arms and legs like tanks, lungs unstoppable. And I was but a mere little girl amongst them. At the start, we realized that we were even more out of our league than I thought. People were standing around in the dark, like ogres almost, monstrous beasts who did this kind of thing every day. Dan and I huddled in the back of the unlit room, pinning our numbers on, me worrying about the fact that I hadn’t pooped. I thought of the biggest day I had done on skis: a mere 3,500’ day. Then it was time to put our skis on, Dan and I trying to sneak into the back of the pack, but our packs were huge and I wasn’t feeling all that agile so early in the morning. And then we started! Neither of us were ready – Dan’s poles were off, and my pack was on the ground, so we hoisted everything, and started off. As we started, I felt okay. My mind was still hazy that early, and I knew I didn’t want to blow up, so I paced. And skinned. We skinned and skinned and skinned. 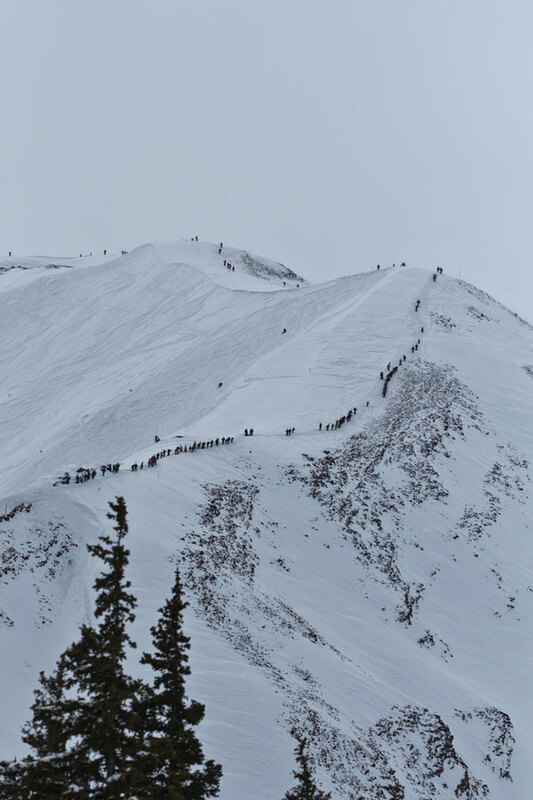 The vast majority of teams had exploded out of the start and pulled ahead very quickly, a mass of dark moving up the sweeping slopes of Snowmass in the pre-dawn light. Dan and I plodded along. And then we were ripping skins at the top, and skiing. And what skiing! Pretty? No. Survival skiing? Yes. Extremely tight trees, marred with branches and rocks sticking up through the snow. It had snowed 72” before our race (they had to do avy control before we started), but the mob of racers before us had swept it all off the ridge. There were race marshals all along the ridge, warning us not to drop down either side. I didn’t tell them that my legs weren’t really up to skiing through powder. I was going to stay in the track. Then it was back on with the skins, and I was glad. Skinning, while hard, was not nearly the painful endeavor that skiing was, so we once again started trudging. This was one of the best parts of the race, we were in true backcountry, following a simple skin track. 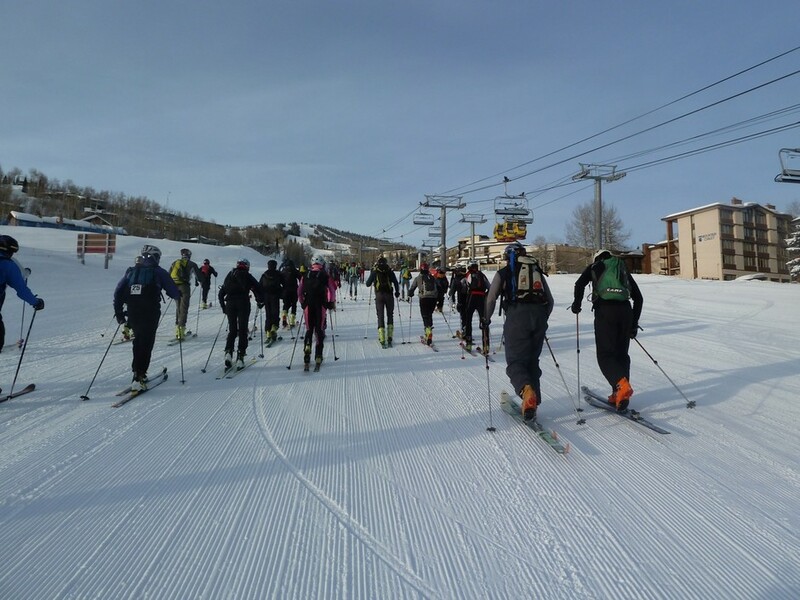 When we reached the base of Buttermilk, I was disappointed to learn that I had entered myself into a skate skiing race as well, as the transfer from the base of Buttermilk to the bottom of Aspen Highlands was long and flat. As I skated along, every muscle in my body screamed and I had the first sensation of crying, but I held it back and kept lifting first the left, than the right leg, and repeating. At the bottom of Aspen Highlands was the first Aid Station. Dan and I refilled water, and I chugged an Ensure, trying not to gag and puke as I drank it. Then it was off up the slope. As we skinned, we passed downhill racers setting up a slalom course, and I had a vague notion that these people were much, much saner than I. As we continued up the seemingly vertical wall, a massive wave of nausea slammed into me, and I wretched several times. The Ensure was not happy in my not happy stomach. 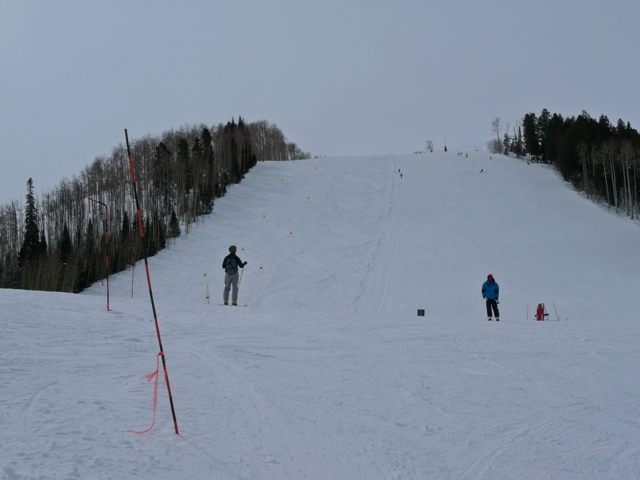 The climb up Aspen Highlands hurt. I was fighting back crying all the time. I wanted to just collapse and cry, I wanted to curl up in bed and sleep – I wanted to be doing absolutely anything except doing what I was doing – an endless slog up an endless mountain. Dan and I went into a 5 minutes on, 1 minute off pattern, and I left my body to do its thing, trying to suppress the nausea building up in me. Spewing the contents of my stomach was going to nothing good for helping us finish the course. I recall it hurt, it hurt a lot, and then I realized I couldn’t feel my toes. I started frantically trying to move them, even though I wasn’t entirely sure if I was moving them or not, as I had no feeling in them. We passed a race official who told us that racers were getting frostbite on the ridge, and I nodded. I was pretty sure I was getting frost nip already. “Oh my god babe, your face it so white!” He nodded, and zipped his shell up more. There wasn’t much we could do. The best we could do at this point was to get to the top, and ski down, to a place warmer, and less windy. So we plugged on. At one point we passed a guy who was screaming about his hands. I didn’t have enough energy in me to tell him to stand up and start skiing down because he wasn’t going to get any warmer up there. Finally, we reached the top. There was a cacophony of people milling about, and a couple of people approached Dan and myself as we collapsed. “We were supposed to meet our friend up here, but he’s dropped out!” They screamed over the winds. “Do you want a peanut butter and jam sandwich?” I thought pb&j sounded way more appetizing than Ensure or Sharkies, so I nodded, and the guy handed me a sandwich, which I managed a couple bites of before I thought I would puke, while the girl ripped my skins and stuffed them in my pack. “Thanks,” I gasped, as they helped Dan as well. I looked around. We were supposed to be following flags. There were no flags anywhere. “Where do we go?” I asked no one in particular. And so that was the way we went. I was present enough to realize that if I had not just skinned up 8,000’, I would highly enjoy this skiing. It was steep, with incredibly nice snow. There were bomb marks from that morning when they had cleared it for us all over the face. As it was though, my legs were screaming. Fortunately, hop turns on skis that weigh all of 5lbs are very easy, and we made it down alright. We skied what felt like forever, before we reached a chairlift. There were still no flags, but another racer told us that we had to skin up a cat track for about half an hour, and we would reach the second Aid Station, and the cut of point. It was about 1PM, so it was looking positive that we would be able to make it. Did we really look good? Because I was feeling kind of crappy. We reached the Aid Station, and the cutoff point in time, downed another Ensure, and left. The trail we went down did not do much for my mood. It was sketchy for wobbly legs, extremely narrow, too narrow to snowplow to slow down, so we rocketed around, at the very edge of control, sometimes tipping over that edge. My legs screamed at me, and I felt the tears coming back. I knew we still had a 3,000’ elevation climb in front of us, a totally demoralizing one from everything that everybody had said, and here we were getting beat up on the downhill. The climb was just as demoralizing as everyone had said. It was 3,000’ over a 6 mile span, so fairly gradual, when all I wanted was to get this thing over with. I fought back tears more and more often, and my stomach’s ability to eat because less and less. I started guzzling water, but another Ensure was out of the question. If I puked now, I might not make it. Slowly, ever so slowly, we made progress. And then Pete Swenson found us on the trail and told us we were 40 minutes from the top, an hour from the end of the ordeal. It didn’t do much to make me feel better. We continued, 10 minutes skinning, 1 minute rest. I could feel the end of my tether flapping around close by. We reached the top, and it was beautiful. There was a moment as I stared out across the stunning mountains, at such a vantage point I could see a lot of what we had skied, and I felt like crying again. Dan reminded me we weren’t finished, I had to hold myself together. I was freezing, it felt like my warming system was shutting down. I had on every layer I had with me, and was still cold. Everything hurt. I was ready to start bawling on the spot. Dan had to help me rip my skins and zip up my jacket. I felt reduced to a mere child. I had disks floating in my vision, from exhaustion, and I wanted to just lie down right there in the howling wind and sleep. Dan helped me put my pack on and handed me my poles. I nodded, and we skied. I had been afraid that they would send us down a double black diamond bump run, but they were finally having mercy on us – we went down an extremely mellow groomer. All the way down, my body was scolding me. My back screamed in agony, along with my legs, my toes, my hips, and my hands. And then, I saw the finish, and people were cheering! People were cheering for us! Even though it had taken us 11 hours, they were still there, cheering for us, and we skied ungracefully down to the finish line. That was when I cried. Woo Hoo! Awesome story…I got tired just reading it. OMG – that was a riveting read. Thank goodness you made it. To me, sounds like hell. Well done!